Every year for Easter I love creating Easter decor using eggs. My daughter and I have made glitter eggs, decoupaged eggs, gold leaf eggs, Ukranian Pisanky eggs, etc. 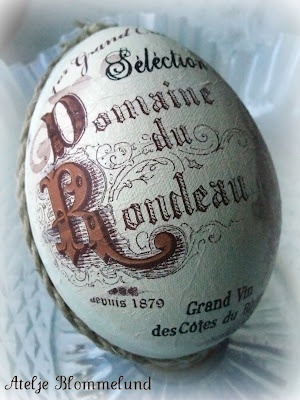 A few years ago, I came up with the idea of transferring French type onto painted ceramic eggs. 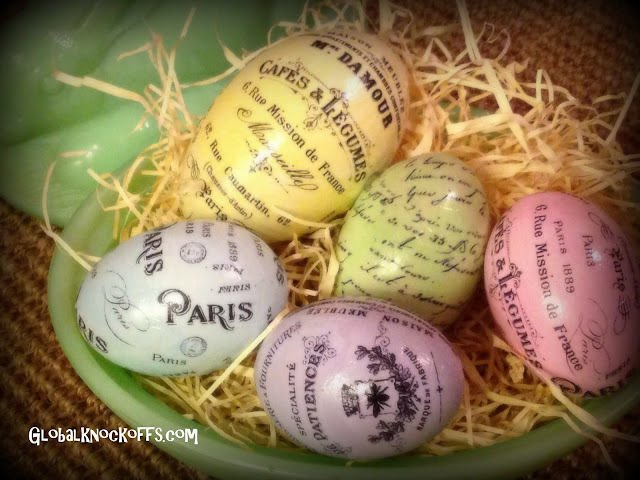 I was inspired by some beautiful French motif eggs I saw online. 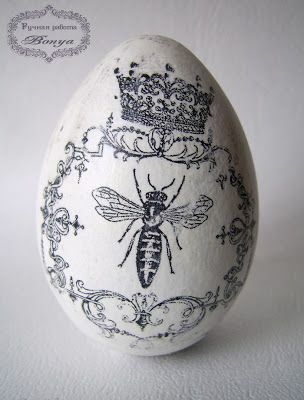 I love this black and white vintage French egg (above) from Bonya. And the romantic one from Nostalgi och Romantik (below) featuring French typography is exquisite. I bought a few white ceramic eggs from Hobby Lobby and painted them soft pastel colors. I love color rather than the simple black and white. I copied some French typography designs from The Graphics Fairy (see above). You could also just do a search for French typography images on Google. Using Microsoft Word, I pasted the images in reverse and resized them to fit eggs. Many of the images online are already in reverse so you don't have to do it yourself. I used a transfer method from Graphix Rub-Onz. I carefully followed their directions for transferring the black and white designs onto the eggs, which included printing the images on their matte paper first. I ended up cutting the images into small pieces before transferring them onto the egg because some of the images were too big and wouldn't lay flat. The clear sheet that sticks to the egg can get difficult to handle and often curls up and causes bumps. I pressed firmly and pulled off the bumpy residue with my finger nail. At first it can look a little messy, but the vintage French shabby chic look isn't neat and perfect anyway. Because the images were on a shiny surface you noticed the cutout of each. I sprayed the entire surface of each egg with a glossy clear enamel. Now the entire egg is glossy and shiny. J'aime mes beaux oeufs de Pâques français. 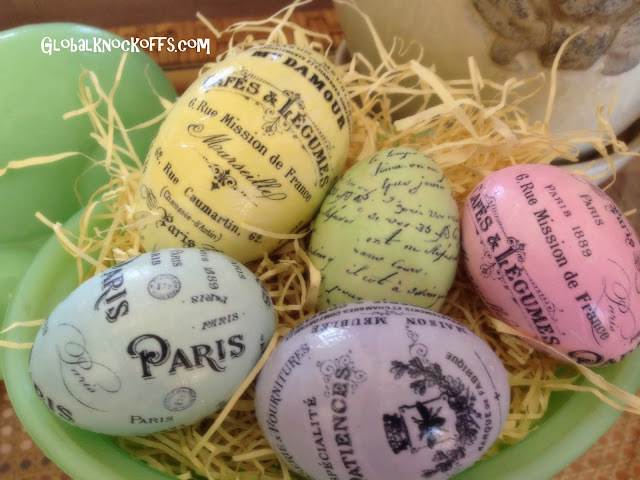 I love my beautiful French Easter eggs! The entire process took about 5 hours, so it is time-consuming. I also recommend using ceramic or wooden eggs. The eggs are handled and pressed on quite a bit. Real eggs are fragile and might break. 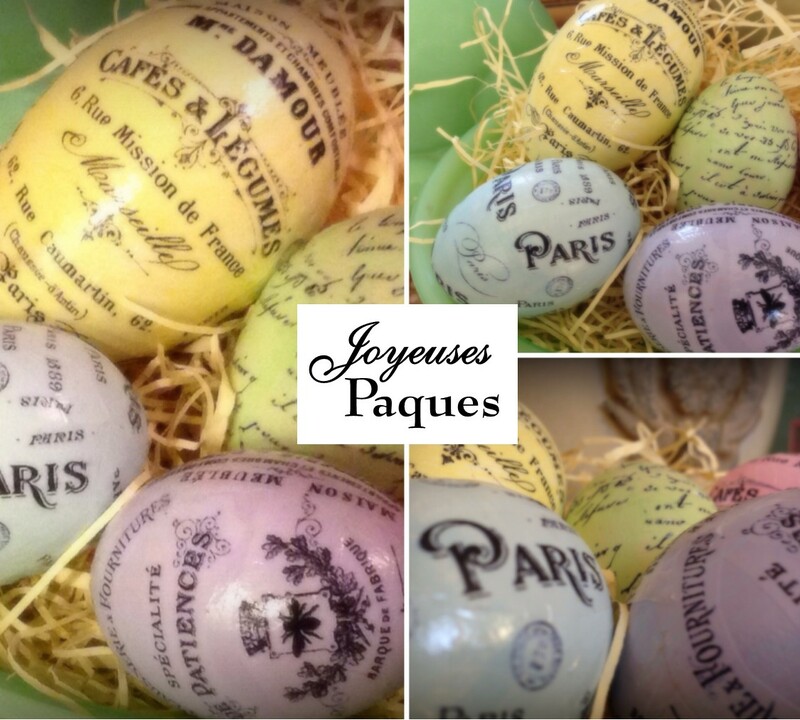 Joyeuses Paques! Happy Easter. I hope you have been inspired to create your own beautiful French Easter eggs.